And local independent bookstores near you! The Sharing Solution speaks to Americans’ growing desire to not only live more sustainably, but also save money and create stronger communities. Sharing is a simple step anyone – young or old, rich or poor – can take, right now, to make a difference. Who can benefit from sharing? * Anyone concerned about the environment and wants to adopt a more sustainable lifestyle. 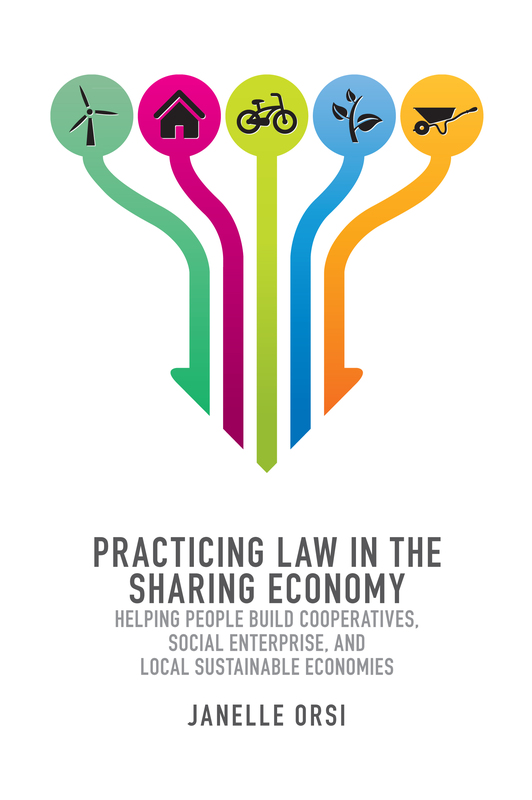 The authors, attorneys Janelle Orsi and Emily Doskow, bring a visionary spirit to developing practical, logistical, and legal frameworks for many types of sharing arrangements. 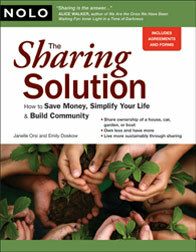 The ultimate beauty of sharing is that it’s a solution we create for ourselves. It’s not a government program, nor is it the “latest and greatest” product marketed to us on billboards. It’s a solution based on our own needs and lifestyles, in our own communities. It’s a way for each of us to shape our own lives in positive ways and simultaneously benefit the world as a whole. In that respect, sharing is more than a simple trend: Some might even say our society is moving toward a sharing revolution. We hope you’ll use The Sharing Solution to become part of it. Attorney Janelle Orsi runs a solo law practice specializing in non-profit, small business, and real estate law, focused on helping people to share resources, build community, and live more sustainably. Emily Doskow is a practicing attorney specializing in family law, including adoption, parentage issues, domestic partnership formation and dissolution, and divorce. She is the author of Nolo’s Essential Guide to Divorce and the editor of many Nolo titles. Both live in the San Francisco Bay Area.